Tired of those turkey leftovers or just simply tired from the mad rush of Christmas then why not have stew. Make one big pot and have a no fuss dinner for 2 maybe 3 nights. 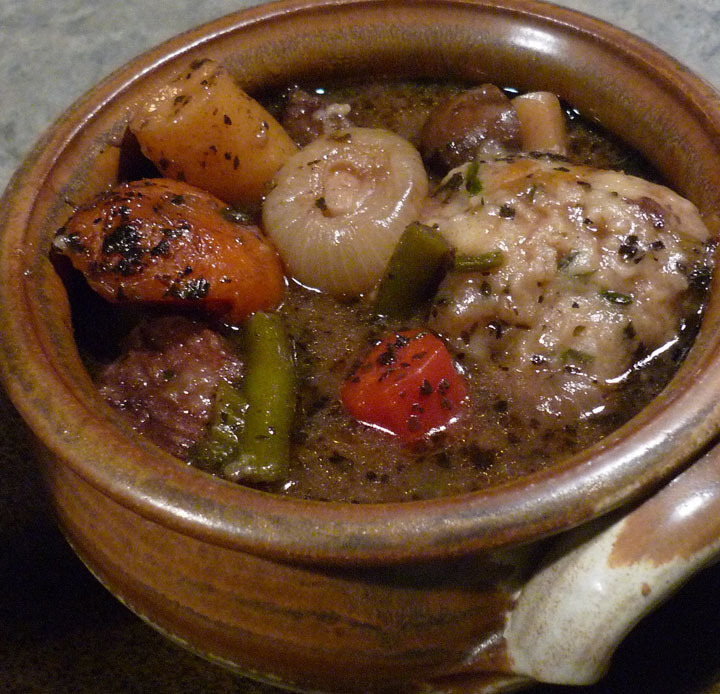 This stew combines prairie bison with produce bought at Saskatoon’s Farmers’ Market. Button and red carrots, parsnips, fingerling potatoes, baby onions, mushrooms, green beans, celery, elephant garlic, plus herbs and seasonings of basil, oregano, marjoram, bay leaves, celery leaves, sea salt, fresh ground pepper, and cayenne. Beef stalk, red wine, and a smidgen of Worcestershire will give this bison stew added richness. I cook my stew in a Le Creuset dutch oven at 325 degrees for 3 to 4 hours, but I have also used the traditional cast iron pot with equal results. And I always brown my meat in a coating of flour with seasonings. Bison is very lean so this time I browned the chunks in bacon fat for extra flavor. Do not be shy with your herbs – add at least a tablespoon or more of each. Mix together and make a well. Spoon in meatball size clumps onto hot stew – makes approximately 9 to 10. Return to oven with lid and bake for another hour. Serve with red wine and a hungry crowd.